What is it about Darwin's idea that is so dangerous? You've described the design of natural selection as "brilliant" but "mindless." Can you explain? How do you explain evolution to skeptics? How can you convince them? Can you? You said earlier that you think secular institutions are failing us? Do you include museums? If so what could museums do better? In discussing your book, Breaking the Spell, you’ve said that part of what the book does is to “reveal how the magicians do their tricks” when it comes to organized religion. Can you elaborate? You've talked about teaching a course on World Religions in public schools. What do you think that would accomplish? 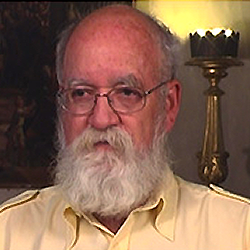 Daniel Dennett, the author of Breaking the Spell (Viking, 2006), Freedom Evolves (Viking Penguin, 2003) and Darwin's Dangerous Idea (Simon & Schuster, 1995), is University Professor and Austin B. Fletcher Professor of Philosophy, and Co-Director of the Center for Cognitive Studies at Tufts University. He lives with his wife in North Andover, Massachusetts, and has a daughter, a son, and a grandson. He was born in Boston in 1942, the son of a historian by the same name, and received his B.A. in philosophy from Harvard in 1963. He then went to Oxford to work with Gilbert Ryle, under whose supervision he completed the D.Phil. in philosophy in 1965. He taught at U.C. Irvine from 1965 to 1971, when he moved to Tufts, where he has taught ever since, aside from periods visiting at Harvard, Pittsburgh, Oxford, and the Ecole Normal Superieure in Paris.